Achingly romantic hotel with crystal chandeliers,fragrant gardens, gourmet cuisine,frescoed ceilings and fourposter beds. La Tinaia serves up delicious locally sourced, seasonal produce, in the famed Chianti wine region- foodie heaven. Guests are offered a free welcome drink from the bar. Pets stay for free, prior warning is needed. Outdoor swimming pool fringed with hydrangea and jasmine. Indulge in a little 'me time' with tailor made treatments at the hotel spa that focus on the natural bounty of Chianti. Lounge beside the pool with a good book and a glass wine, followed by a session in the sauna. 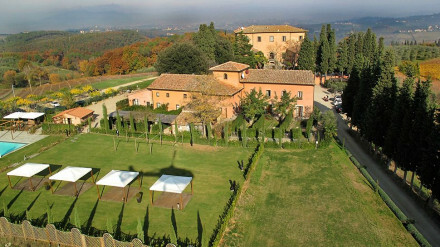 The hotel will organise a wine and olive oil tasting at Villa Le Corti, well worth it! Spend some time walking through the enchanting Tuscan countryside, explore the surrounding meadows, hills and vineyards. Cooking classes can be arranged from the on-site chefs, learn to whip up your favourite dishes from the menu. 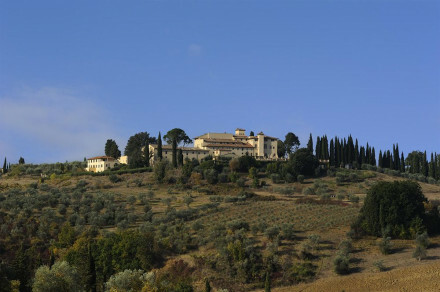 “Located twenty minutes outside of Florence, in the heart of the Chianti wine-growing area, this Renaissance villa has been entirely restored and offers the hospitality and atmosphere of a patrician family country house. Every bedroom has a private bathroom, minibar, satellite tv, direct dial telephone and modem, safe, as well as air conditioning. The outdoor swimming pool is open from June until the end of September, while the well-stocked wine cellar is a veritable treasure trove all the year round. A conference room is available should guests wish to organize small business meetings. Upon request and depending on the season, we can organize trips to Siena during the famous Palio horse race, to San Miniato to hunt for truffles, to nearby farms to enjoy the newly pressed olive-oil and local cheese, to the most prestigious wineries for a memorable wine tasting. Please enter our site and discover Villa Il Poggiale, its reception rooms, bedrooms, activities and facilities. Seated under the Renaissance Loggia, guests can look out over the formal Italian gardens and be enveloped in the fragrance of old roses and flowering shrubs. Ornamental bushes also grow in the beautiful central courtyard and garden surrounding the swimming pool. Even if you are sipping your tea or working on your notebook (the garden is also covered by broadband Wireless Internet and the VoIP service to make phone calls is available) you can still enjoy the Tuscan countryside.The Villa has wonderful light and spacious rooms. The large hall, the heart of the house, with its beautifully painted doors, has comfortable armchairs and welcoming sofas, while various other smaller lounges offer quiet, cozy corners for reading and relaxation. Each room has its own unique character. The walls are painted in soft pastels made from natural pigments. The fabrics used for curtains and canopies come from small Tuscan artisan workshops. Oriental silks, on the other hand, have been used in the salons and rooms on the ground floor. Our chef is a character who every night prepares a simple and refined buffet with traditional Tuscan cooking and home specialities. He will explain in person what he has prepared and reveal the little secrets of his cooking. We also offer a selection of prestigious Tuscan wines and also others not so famous from small producers, but nonetheless of excellent quality. Our wellness center has been created to complete your stay among the rolling hills of the Tuscan countryside with moments of relax and wellbeing. 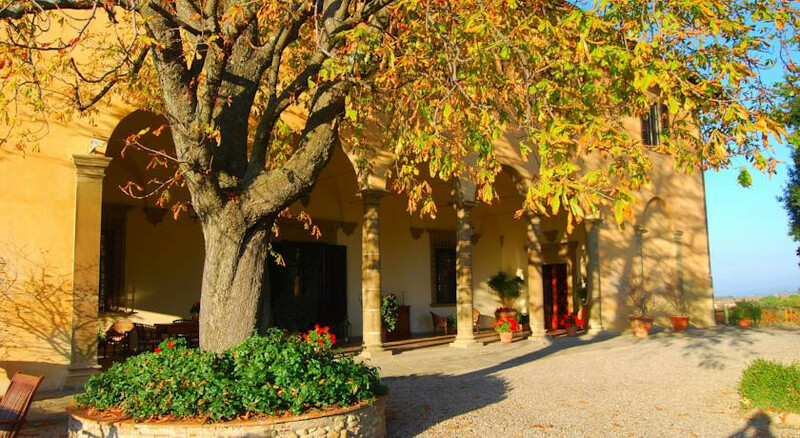 The wellness center has been specifically designed for Villa Il Poggiale and offers simple and efficient treatments with natural products from the Tuscan territory such as grapes, citrus fruits,olives, honey and essential oils. If you wish to exercize among olive groves and vineyards we have created a fitness track, along which you will find several different spots for suggested exercises. We also have a new space with training machines. For all Hydrotherapy lovers there is a warm hydro massage pool with essential oils. Renaissance villa turned upscale boutique hotel. Wonderful views of the rolling countryside.